Because the sun sets behind the Lenzspitze early in the year, the mountain was named after the old word for spring (“Lenz”). The Lenzspitze belongs to the Mischabel group and is the remotest summit of the Nadelgrat, a high ridge running north-south and located to the north of the Dom. The Lenzspitze is the fourth summit of the Mischabel chain. It is one of the best-known summits in the Alps in terms of shape: a perfect pyramid with sharp edges and steep faces. The Nadelgrat links the Lenzspitze, Nadelhorn, Stecknadelhorn, Hohbärghorn and Dirruhorn. “Lenz” means “spring”. Early in the year, seen from Saas-Fee, the sun sets almost exactly behind the Lenzspitze. Clinton Thomas Dent climbed the Lenzspitze in 1870 together with the mountain guide Alexander Burgener and the porter Franz Burgener, following the north-east face to the Nadeljoch and then the north-west ridge to the summit. This route is hardly used nowadays. 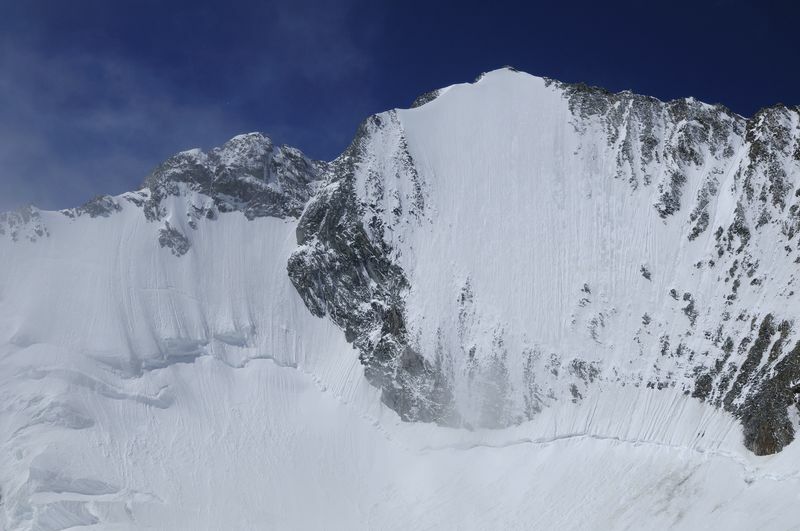 The first ascent via the north-east ridge was by William Woodman Goodman on 3 August 1882, with the guides Ambros Supersaxo and Theodor Andenmatten. The north-east flank, an ice wall with an angle of up to 55°, was conquered on 7 July 1911 by Dietrich von Bethmann-Hollweg, together with Oskar and Othmar Supersaxo, by cutting steps. Heini Holzer skied this face on 22 July 1972.